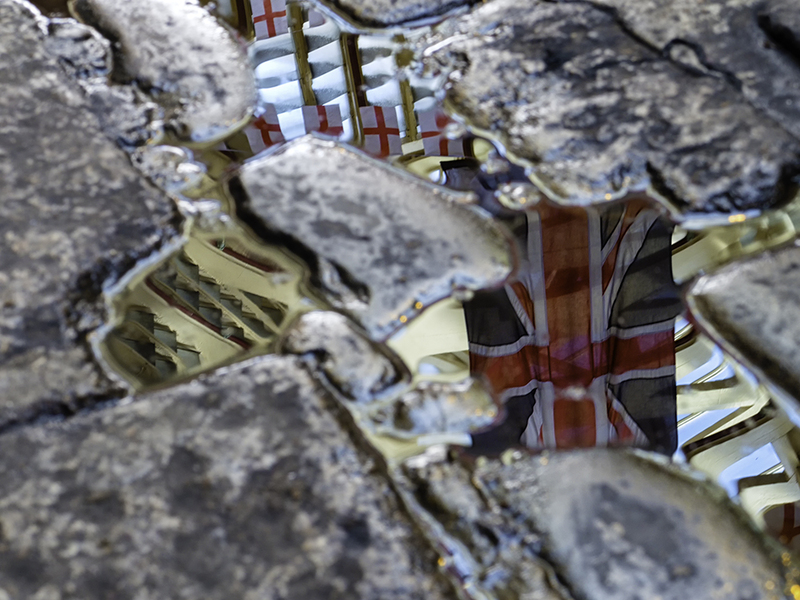 Reflections in Leadenhall Market. Panasonic LX7 compact camera. So, here I am in London with a couple of friends for the day and our sole purpose is to enjoy ourselves taking pictures. But I wasn’t. Not because this isn’t a great city or I wasn’t happy being with my friends, I just wasn’t inspired. I was taking photographs but I wasn’t creating photography. My mojo had gone and I just couldn’t stay enthused. I was used to this dip happening around early afternoon but today I just hadn’t got into gear and now it was mid afternoon. What snapped me out of this was finding a puddle in Leadenhall Market. The market itself had been decorated with flags and whilst pretty wasn’t very interesting. It was only when I found a puddle that showed their reflection that I began to feel interested. I ended up slaving over trying to create the image above for around half an hour without much luck. Ultimately I decided to put away my main cameras and just work with the little Panasonic LX7. This is where everything just clicked into place and I started to create photography. That little camera is a joy to use. I love the control it gives me and the quality is very good. I have since printed some of my shots at A2 and they look super (but more on that at a later date). After this switch of equipment I started to feel enthused again and everything came together. I even switched back to shooting with my other cameras to vary things and it worked well. This just goes to show the importance of enjoying yourself when taking photographs. I felt the same way about the LX3/5/7 when my main cameras were Canon 1-series. Now my G6 & GX7 have replaced all of them. It’s odd isn’t it how a compact camera can be more enjoyable than a well made professional tool. I have never felt that I prefer a compact to Micro 43 before though. That’s a great shot, I always love using my lx7 although since I got the gr it’s been sat on my desk. That said I can’t see me selling it especially since I put the dent in it! Thans, I’m pleased you like the image. Don’t sell the LX you will miss it. I sold my LX5 and still regret it despite now having the LX7. Really like the shot, I think sometimes when we have got out “big cameras” out our eyes are looking for something that is “worthy” of the camera. Just by changing the camera we change how we are looking at a scene or a place or an object. If I have my compact Fuji out then I will be happy snappy because hey point and shoot and it changes what I am seeing. Thanks. I think your right and make a good point about being worthy of taking the shot. I tend to reach for my EM5 if it look promissing but I seem to experiment more with the compact. I feel as if it’s easier to control in some ways. It’s not quite the same effort as using other cameras.